If you can make other people feel good about themselves, that speaks volumes about who you are as a person. Too many people in the world are lost, depressed, and hurting, but what if you could do or say something that could empower them and completely transform their outlook on life? You might just be one person, but you have unlimited potential to impact someone’s life by your words and actions. Hurt people hurt others, but healed people do the opposite. If we all resolved to show compassion and unconditional love to people instead of perpetuating hate and animosity, we would have a totally different world. Best of all, you can change the world with good intentions, and you don’t have to spend a dime. Tell someone why you appreciate them and what you love about them. Our society encourages people to gossip and put down others just to feed our egos, but this only causes pain to you and everyone you encounter. Instead of giving in to negativity and needing to drain someone else of energy to supplement yours, tell them how amazing they are. Compliment them and remind them what endearing qualities they have that make them unique. Everyone needs some appreciation and recognition, and you can be the person to show it to them. Sometimes you can see things in others that they can’t even see themselves, because many people forget their own worth. Remind them of their own worthiness, and be brave enough to go beyond your ego. Too many people avoid raw feelings and emotions, thinking they will make them weak and vulnerable. However, our hearts form the bridges between one another, and you will feel more connected to the person by sharing what you admire about them. Give them your full attention. Too many people today only half-listen to each other, playing with their phones or looking in all directions except toward the other person. People avoid eye contact, or simply don’t fully engage with the person. Turn off your brain and phone for a while, and just listen to what the person is saying. You will get much more out of the conversation, and you may even forget you have a phone once you start really listening to the person. Many people hear, but they don’t listen. Hearing means you recognize noise moving into your eardrums, but you aren’t necessarily paying attention to what the noise means. Listening means decoding the implication of the sounds, and attempting to comprehend the words. Next time you have a conversation with someone, put away your phone and just focus on them. They will really appreciate all the attention and respect, and will likely give the same to you. Ask them what the most exciting part of their day was. When you see someone at the grocery store or in line at the bank, greet them with something rather than the usual “Hi, how are you?” This usually leads to a dead-end, because both of you will say “Good,” and the conversation will run dry. Try something that will inspire them to think positively about their day and share with you an experience that made them happy. Even if the most exciting part of their day was their drive to work, at least you got them to practice positive thinking. 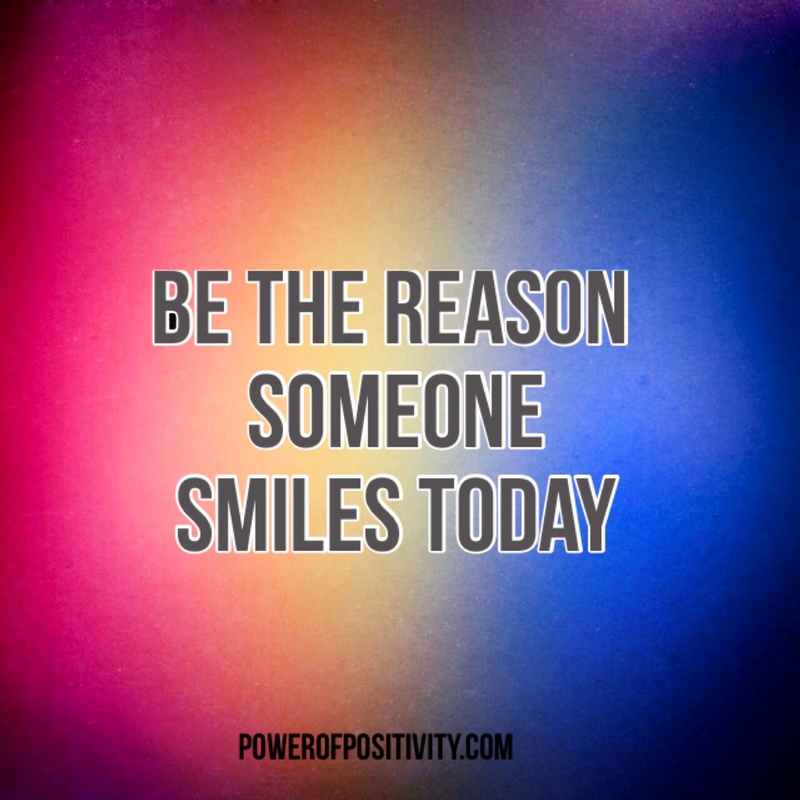 Use conversations with strangers, or even your best friend, as a chance to infuse the world with happy energy and showcase your innate ability to put a smile on someone’s face. We all have this capability, so make sure you put it to good use! Edify them when you’re out together. Nothing makes a person feel better than knowing that others acknowledge their positive traits or accomplishments. If they recently got a promotion at work or fulfilled a huge goal, like publishing a book, make sure others know about it! Everyone deserves praise and support when they finally reach a milestone in life. Besides congratulating them and boasting about their achievements, you can also simply tell others why you admire them as a person. Put them in the limelight for a while and let them bask in all the attention – they will really appreciate you for noticing all their great qualities, plus they will just feel really loved and special. Surprise them with a small gift or exciting plans for the day. This probably only applies to someone you know really well, because you know what types of things and activities they enjoy. Buy something small for your best friend or significant other to show them how much you appreciate them, or make some special plans that you know will mean a lot to them. If they haven’t been to the beach in a really long time and you know they are a total beach bum, take them on a surprise trip to the coast. Or, if their favorite band is playing in your city or somewhere nearby, get them a ticket and go to the show with them. It doesn’t cost money to make others happy, but they will be reminded what a great friend or partner you are if you treat them to their favorite things every once in a while.